The Pitbull’s very short coat needs very little attention. A quick groom with a soft bristled brush once a week will keep it smooth and silky. The American Pitbull Terrier has a higher susceptibility to Canine Hip dysplasia (CHD), than most other breeds. CHD is a malformation of the hip joint, caused from a combination of genetic and environmental factors. Puppies from 8 weeks can be crippled, but other dogs may exhibit no symptoms their entire life. It is sensible before breeding that parents have their hips screened, and the scores are available to potential buyers. The scores show the chance of the puppies suffering from CHD. 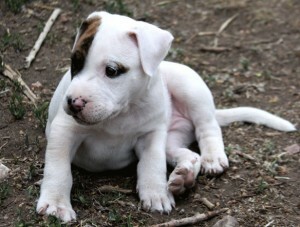 Pitbulls may suffer from congenital heart defects, which is a defect in the heart and greater vessels of a newborn. It can cause blood to flow in an abnormal pattern, block blood flow completely or cause irregular heart rhythm (such as Long QT syndrome). Pitbulls can also be more susceptible to Patella (knee cap) problems and thyroid dysfunction than other breeds. Pitbulls have a very genuine love of people, making them loyal, affectionate companions within the family, and they are generally friendly towards strangers. Unfortunately their protective behaviour can become over obsessive and seemingly unprovoked, they can unleash their immense bone-crushing jaws and their absolute lack of fear can inflict devastating damage on a potential intruder, another dog, or even a child. Pitbulls are strong willed and the fact that they know their own mind can come across as stubborn. They have a high prey drive and a lot of energy, which can deem any training useless, unless the energy is channelled and drained and stimulation is provided for their intelligent minds. However, with a firm hand and early, consistent training, they can be fantastic loyal and obedient companions. Trust, respect and training equals a perfect Pitbull pet. Pitbulls are athletes and go way beyond the old pit fighting sport. They can excel in activities from dog agility, weight pulling, flyball, lure coursing and even in schutzhund. Exercise is crucial to prevent frustrated, destructive boredom. Some are more like lap dogs, but exercise is still needed to keep them fit and healthy. At least 2 daily walks are needed, 3 or 4 are ideal at 30mins to 1 hour each – but they’ll never refuse more! In the 1870s, Staffordshire Bull Terriers crossed the Atlantic from England to North America for organised dog fighting. Selective breeding began to make the dog taller and heavier, with a bigger chest and larger head to accommodate powerful jaws, and consistently beat the smaller Staffy. 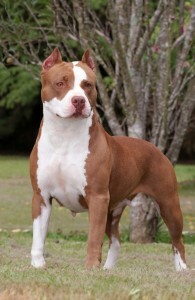 The American Pitbull Terrier fighting machine was created. In 1898, the Pitbull’s creators tried to introduce it to the AKC, but it was rejected due to its associations as a fighting dog. They wanted to establish pedigrees and record the bloodlines of their great dogs, and so set up their own club, the United Kennel Club. In 1900 pit-fighting in America was outlawed. However up until 1990s it was still widespread, having gone underground. The high-stakes involved in gambling kept the bloody sport alive. 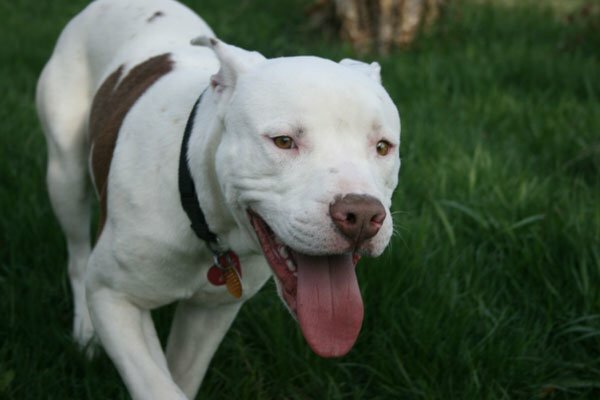 In England some Pitbulls began to get imported in the 1980s. Incidents with people and other dogs caused the British Government to pass the Dangerous Dogs Act in 1991. Determined not to let dog fighting become a parallel existence to what was occurring in America, the act was rigorously enforced and some 1,000 canine suspects were held at one time. 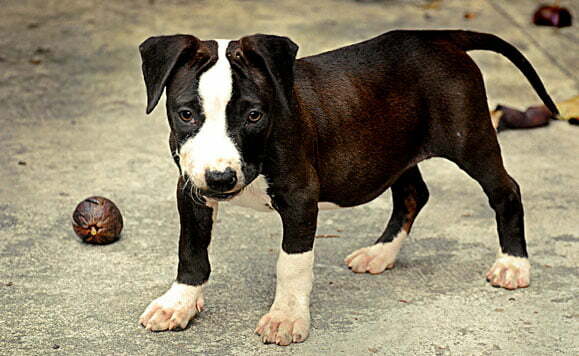 The Pitbull’s resemblance to its ancestor, the Staffy, caused many innocent dogs to be impounded. Clearer guidelines are now in place for the police to follow, and DNA testing is sometimes used to determine what is a Pitbull, and what is just a cousin. Daddy – The Dog Whisperer’s (Cesar Millan) faithful, mellow and loving companion. One of his forty dogs that often accompanies him to rehabilitate unstable canine clients. Pete the pup – The famous Pitbull dog character from The Little Rascals that aired during the 1920s and 1930s. Actresses Jessica Alba and Jessica Biel (pictured) also own Pitbulls. “Pitbull” is NOT a breed.